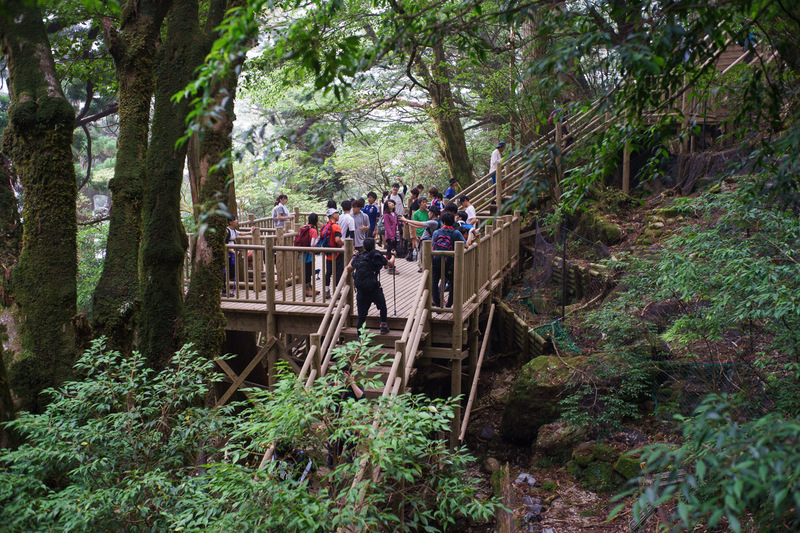 As you can imagine, it’s a pretty popular place to take pictures, particularly of couples so there are sometimes queues forming up… To get a good shot a somewhat wide lens is required, the one above was made with a 35mm lens but I had to basically lie on the floor in a really uncomforable position :p.
The path continues up through the forest, often on elevated wooden planks to protect the ground. 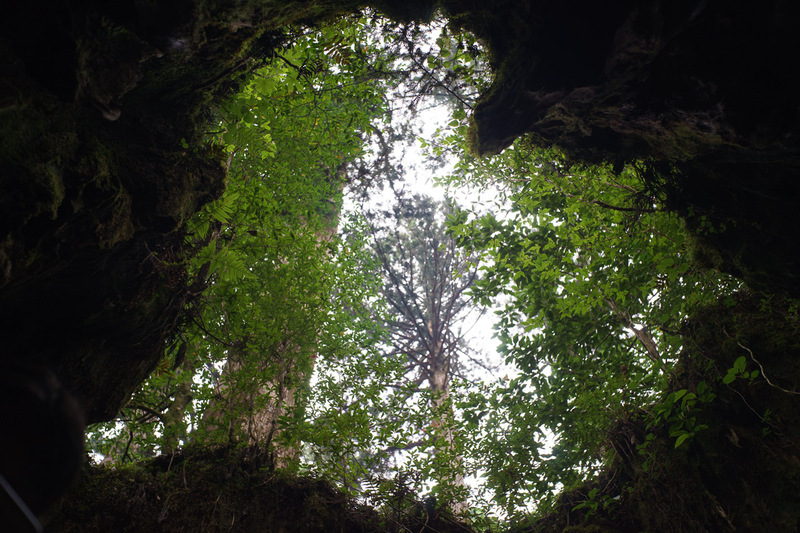 This time, there were also small windows through which we could get a glimpse of the “outside”, which were in turn blocked by low hanging clouds, like so often on Yakushima. After a few more turns, approx. 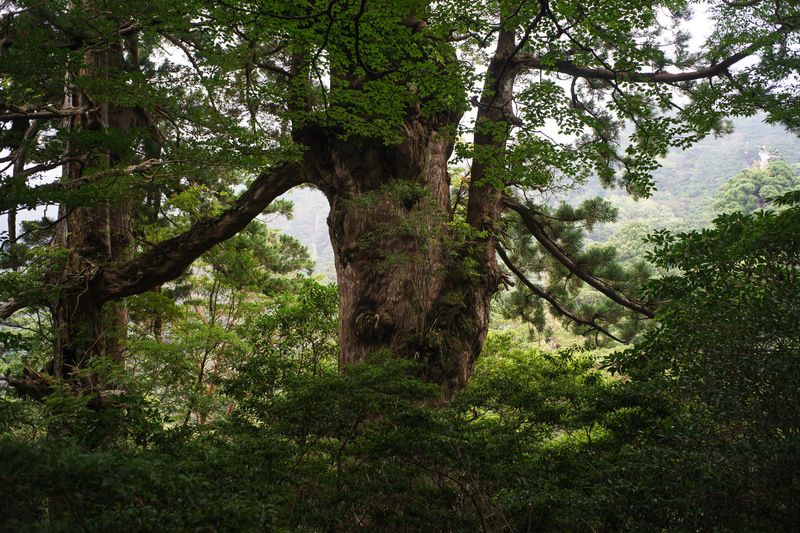 2h from the Wilson Stump the huge Jomon Sugi (縄文杉) comes into view. 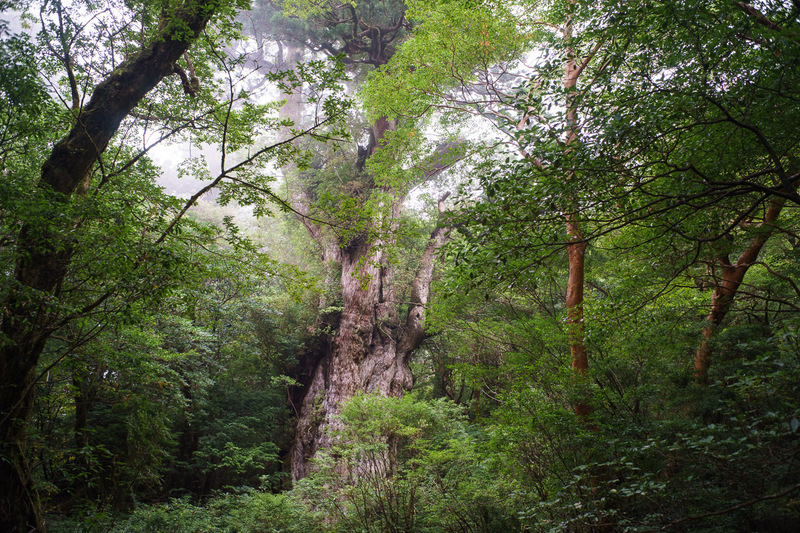 It’s 25.3m high and over a thousand years old. Apparently, more than 10 different types of other plants are growing on the tree itself! To view the tree, two observation decks have been created recently which enable a better view and kind of protect the environment. This is a very good place to take a rest, albeit you surely won’t be the only person resting there. 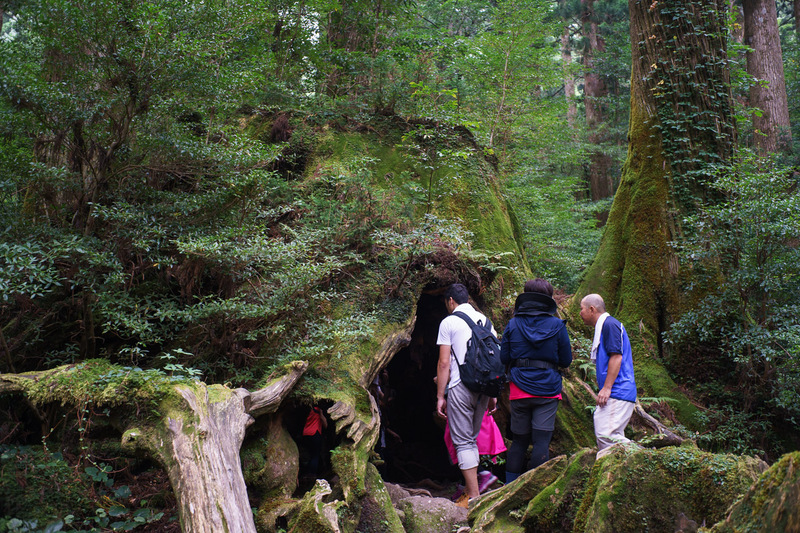 Most day trips from the Arakawa Trail head turn around at the Jomon Sugi so if you prefer next to no people it’s better to take a rest a little further on. From this point on the trail becomes a little bit harder to spot. 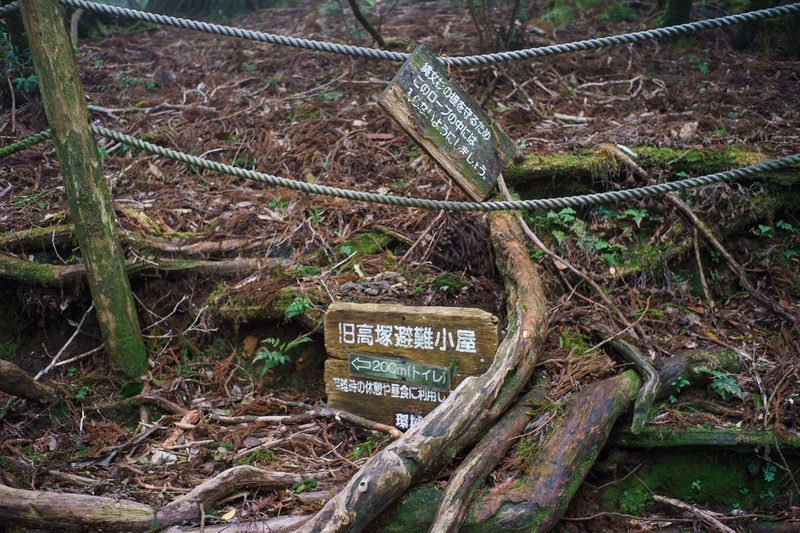 There was a little sign in Japanese indicating the direction towards the Takatsuka Hut (高塚小屋) but we missed it the first time around and therefore did two laps around Jomon Sugi. After approx. 10mins we reached the Takatsuka Hut, which consists of an old, run down hut and a newly built emergency hut. Note that the emergency hut is not intendet for people staying there regularly and thus only to be used in an emergency. 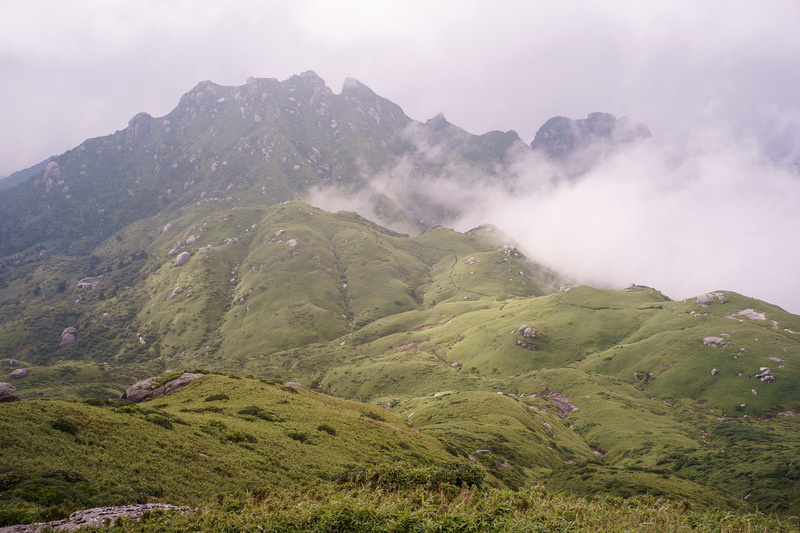 I’d recommend not to stay at the Takatsuka hut but to hike further (1.7km) towards the Shin-Takatsuka Hut (新高塚小屋). 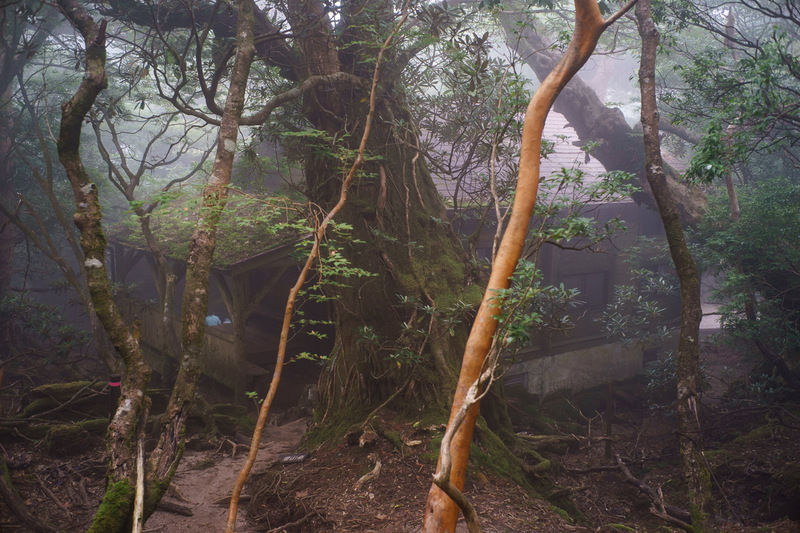 After about 1h the Shin-Takatsuka hut (1475m altitude) peeked through the thick fog and forest. It was a very foggy day.. The hut is fairly new and has wooden planks surrounding it where you can pitch your tent (if it is freestanding, otherwise you might need to freestyle with ropes…). While the trail continues to be surrounded by big trees, it definitely gets lighter from here on and the feeling of daylight comes up more and more. 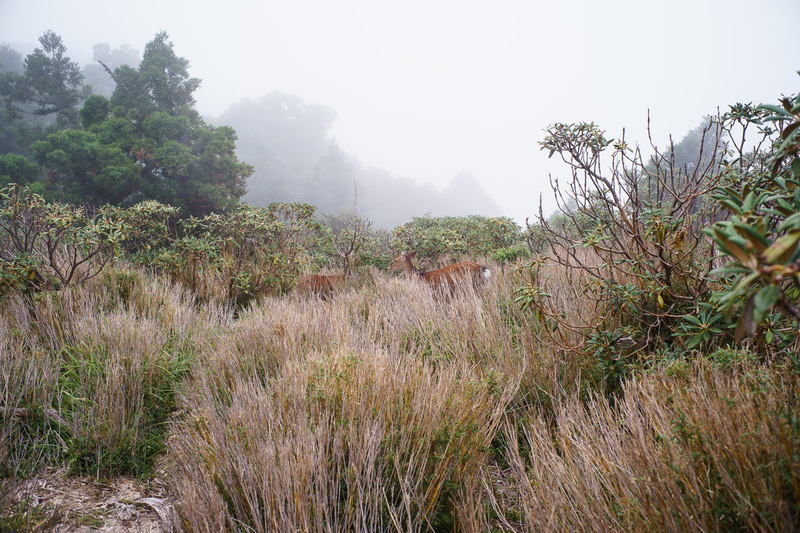 At 1620m we got out of the forest for the first time and were greeted by deers! 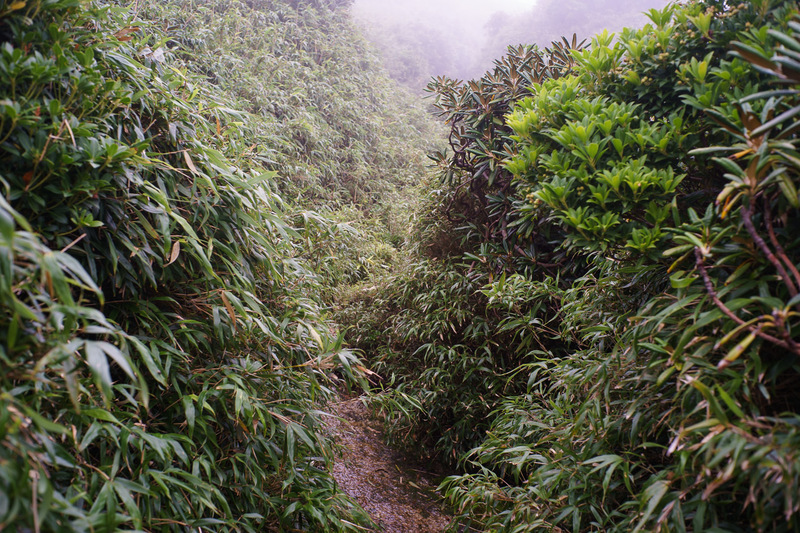 From then on, the path alternated between open skies and forest, making for a very nice atmosphere to walk through :)! After one more hour we finally escaped most of the forrest and the peaks came into view. Although only for brief periods as the clouds were moving at an incredible speed! Close-by was also a place which could make for a good emergency camp ground. Those places are rare on the trial that’s why I’m mentioning them, this one is located at 30°20’36″N 130°30’20″E and approx. 2h from Shin-Takatsuka hut. From there it’ll take about 1h till the summit of Mt. Miyanoura. Finally we made it to the top! And as we were kind of late, we were the only people which was an incredible feeling. From the Shin-Takatsuka hut it took ~3h of moderately paced walking with breaks. 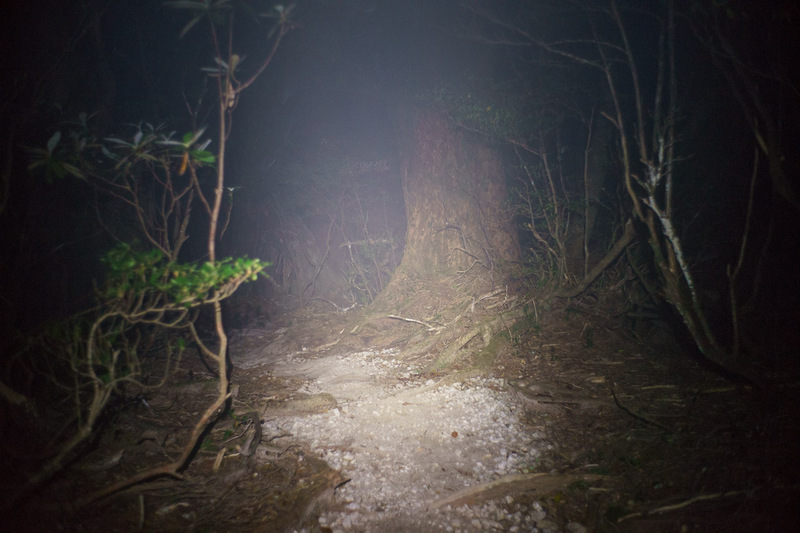 After an extended break with food we continued, knowing that it was fairly late in the day and we definitely wouldn’t be able to make it to the Yodogawa Hut before dark. Descending the mountain this absurd stone constellation came into view… If there would’ve been a little more fog then it might actually look scary! From the summit on the trail is going up and down a lot but the average altitude is relatively constant. As we did not have a clear image of how the second part of the trial would look we started to worry a little bit as the dark set in. 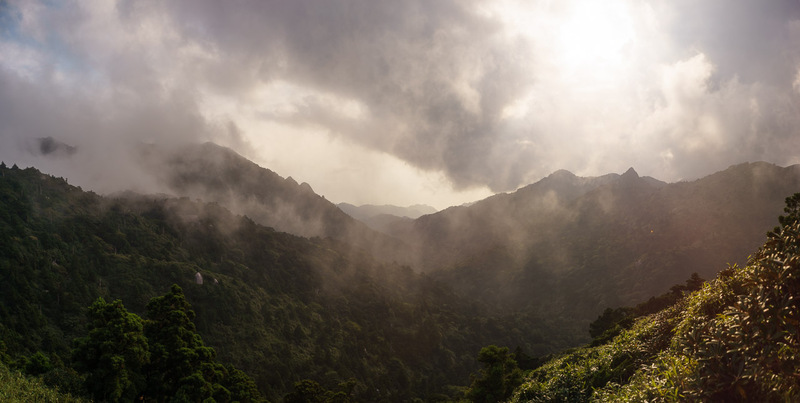 However, beautiful light ensured…. 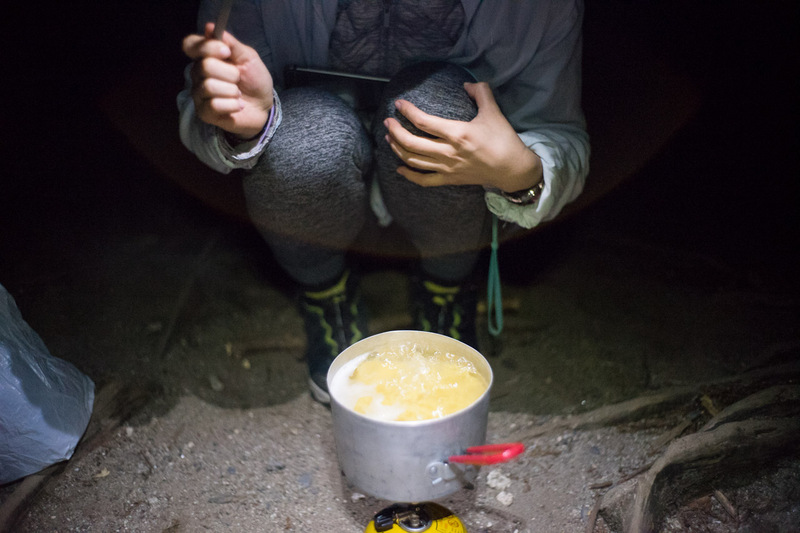 It was now really really dark in the forest and the fog made it more difficult to see despite the head torches.. 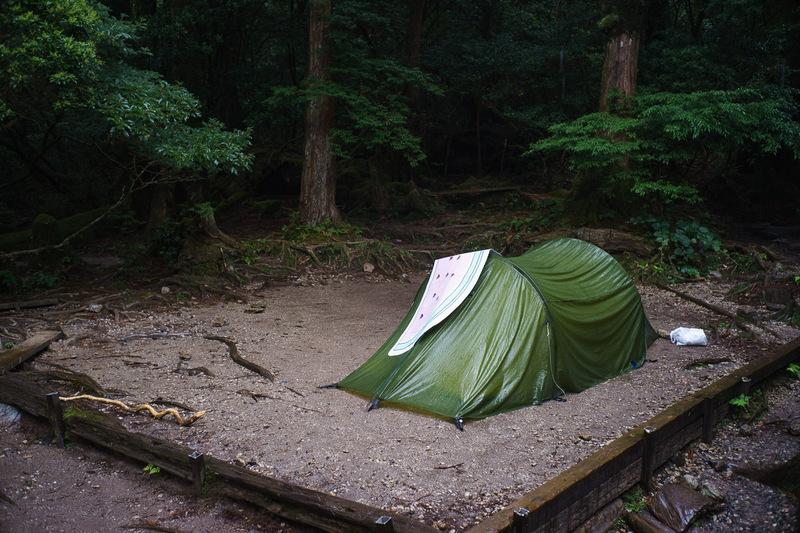 The Yodogawa hut had a designated camping area in front of the hut, which was very nice. The river providing water is also close by. During the night it unfortunately began to rain so we had to pack up out stuff while it was still wet. 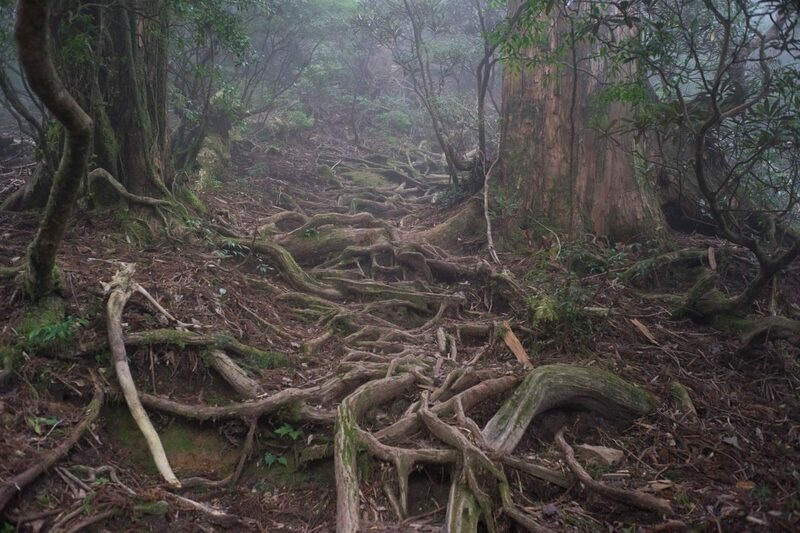 All in all I have to conclude that Yakushima is a great place for hiking, especially as the ancient forest envrionment is something different to the alpine environments. I would definitely like to come back to this underrated island! Really enjoyed reading your report and seeing the photos. 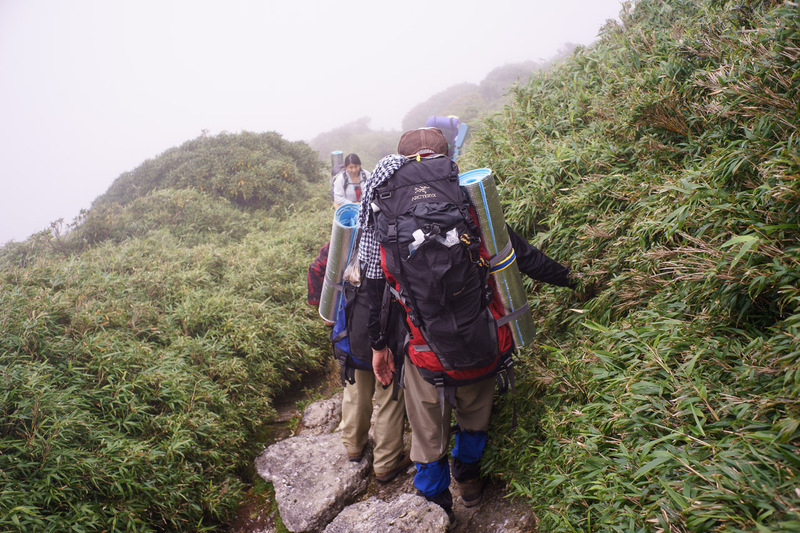 I hiked the opposite direction (from Onoaida to Shiratani Unsuikyo) in late December. 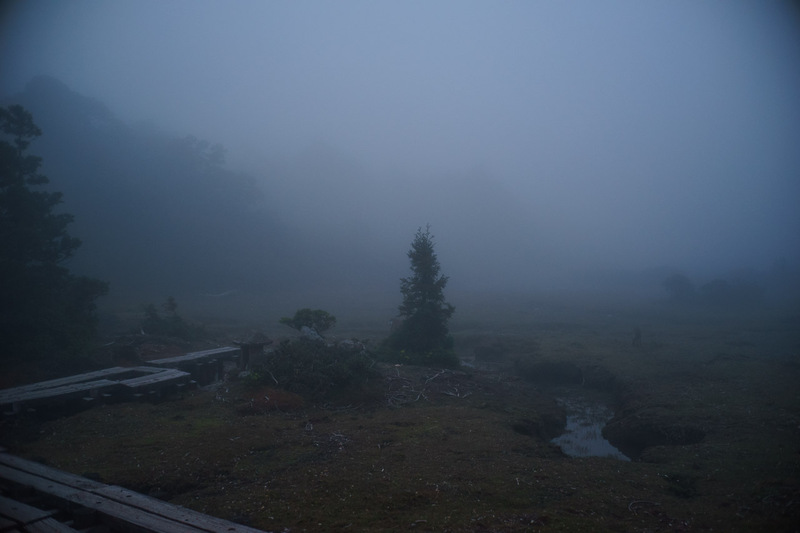 It was very beautiful – although I didn’t see much above the tree line because of snow and fog! Hey NB! There was around 6-12 inches of snow on the upper trail and I ended up wearing mini-crampons from Yodogawa to Shin-Takatsuka hut. Some sections would have been quite slippery and dangerous without them. 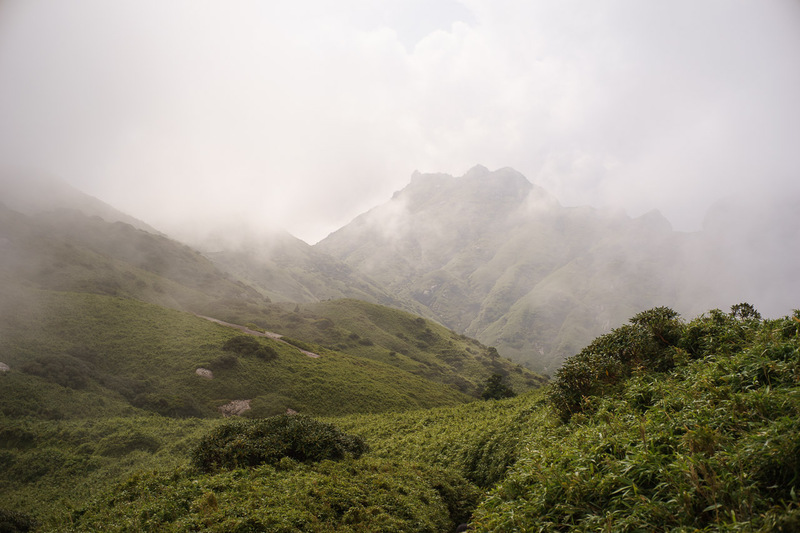 I did see two other solo hikers up there, so it was good to know I wasn’t the only crazy person ;) Excellent work on the blog, I look forward to reading more. Hi! 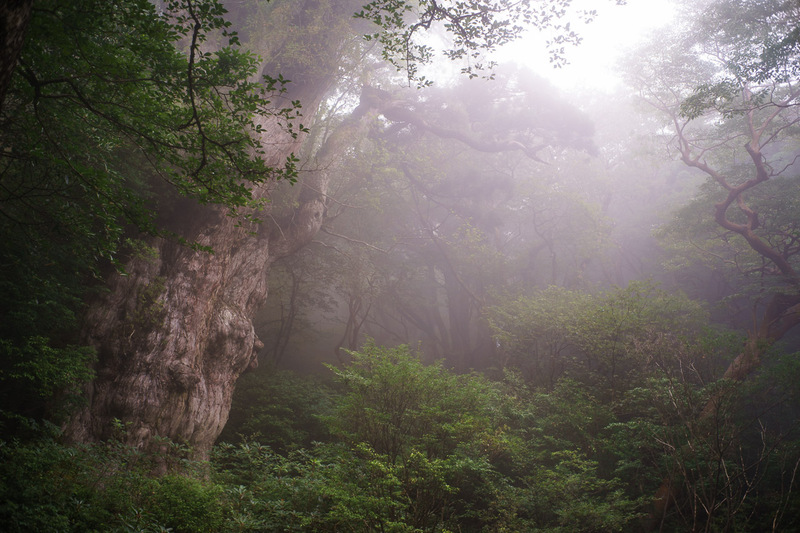 Bumped to not have seen your post on Yakushima sooner since I immensely benefited during my previous visits to Japan to plan Hokkaido parts of my visit. 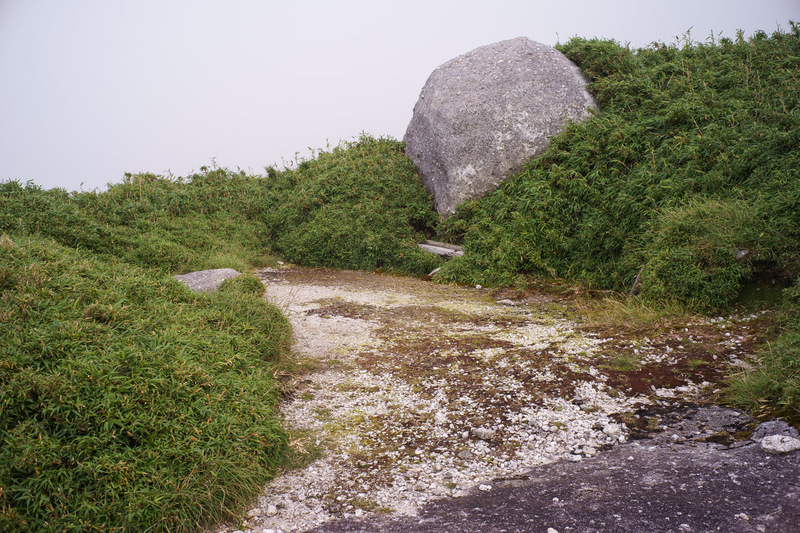 I also recently visited Yakushima and loved the island. 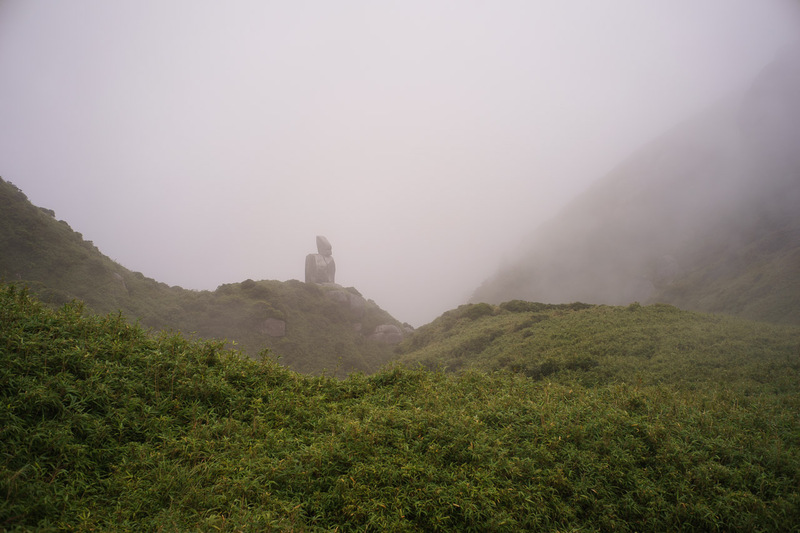 Great post and I wish I had a chance to experience the misty weather in Yakushima, I mostly had bright days.